Kids have added two new words to their vocabulary lately - Beyblade and Beystadium. Such is the phenomenon of Cartoon Network‘s latest phenom Beyblade that most building compounds and play grounds have been transposed into Beystadiums overnight. For the uninitiated, Beyblade has its origins in ancient Japanese spinning top ‘Bei Goma‘ and it involves spinning blades, which are launched into a Beystadium - the battling arena that is usually two-three feet in diameter. 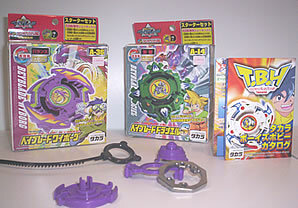 In the series, as per legend, some Beyblades have bit-beasts - the spirits of ancient creatures that reside in the Blade-bit and beybladers must learn to harness their powers to win their battles. The series is the story of Tyson, a young teen who learns to harness the power of his ancestors to perfect his technique in Beyblading. The other key characters of the show are Kai, Ray, Kenny and Max. By joining forces with an international team of heroes they embark on a globetrotting quest to battle their way to the world championships. Two players play the game and launch their tops into the Beystadium. The top that manages to fling the other blade out of the Beystadium is declared the superior blade and the owner gets to keep both the blades. Beyblade championship therefore implies winning the most number of blades. The show, which was launched on Cartoon Network on 20 May, has managed to whirl kids into its maze within no time. The show airs from Monday to Friday at 5:30 pm. Interestingly, in the first month of launch Beyblade on an average rated 1+ TVR as compared to Pokémon, which got a TVR of 0.8 in its first month. Cartoon Network Enterprise India and South Asia director Jiggy George says, "Earlier this year the channel launched merchandising around a strong girl brand - Powerpuff Girls. Post that we needed to launch a strong boy property, which would compliment the girl property and Beyblade was the answer to that." And what‘s more, Cartoon Network Enterprises inked a deal with Funskool India, the Beyblades toys have seen a wipeout success. So much so that there is no new stock in the market till October. There are about 30 different kinds of Beyblades in the market, which are priced between Rs 150 - Rs 349. The toys are popular among kids aged 5 - 13 years and its popularity is peer group led. Hence if one doesn‘t have a Beyblade, he tends to feel left out. By Diwali, the Beyblade line of products will be expanded to include apparel, gifts and novelty, stationery, plastics, etc. These will be made available in Shopper‘s Stop too by Diwali. "Last year we had a huge hit in Pokémon but we didn‘t have the rights for it on the licensing and hence we couldn‘t leverage the show‘s success in any other form except for television. We go after only those properties, which we instinctively think are going to be larger than life and also those properties that the network itself is putting all its thrust behind. After Pokémon, we knew that the real big property that we were going to go after was Beyblade," says George. Beyblade is broadcast in more than 60 countries across the globe. In the US, it airs on Cartoon Network but the channel doesn‘t hold the merchandising rights for it in any other country except India. "The importance of why it would be huge is because the tops are central to this show and we were sure that these were going to be larger than life," says George. In India, the network is going easy on the promotions side and has inked an annual deal with ITC for Beyblade, which will be rolled out closer to Diwali. The deal is across ITC‘s brands like Candy Man. The network will also be looking at more such promotional licenses‘ partners, who compliment the show and the network. 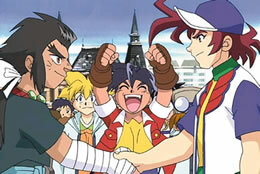 Beyblade has scored the No 1 rating in ABC Family (USA), YTV (Canada) and Cartoon Network (UK). Beyblade has more than 1000 merchandising licensing products with 300 licensees worldwide. It is the No 1 selling toy in Japan, Canada, UK, Australia and many other countries with more than 100 million units sold worldwide. PS1 and Game Cube video game ranked at No 1 in UK, France, Germany, Italy and Belgium in November 2003. Beyblade has had promotions with top tier partners like Toyota, National, Burger King, Kelloggs and Frito Lay in various countries. The Beyblade promotion with Kellogg‘s in the UK resulted in 10 million packs being sold across seven brands. In France, Belgium and Netherlands 11 million packs across five brands were sold. Promotions with Frito Lay are also in the pipeline but the main thrust of the business will remain toys for the network. "When a show launches, usually it takes about three-four months for it to hot up. Hence we brought in a conservative number of about 100,000 units of Beyblade initially. These were sold out in a month. Starting from this week, we have a sizable quantity of toys that we‘re bringing in to meet the huge demand," says George. A reason, George pointed out as to why Beyblade has been a run away success, is because it is culturally relevant to India. Boys have grown up playing with tops and hence it works as a concept. "From a toy market perspective it is a great value game rather than a volume game because it‘s not paper unlike Pokémon, which had paper trading cards. Beyblades are proper toys. Another fact is that no other show has a toy that is so central to the show itself and hence when they get the toy, they relate to the show even more," says he. When the network plans to launch a new show on the channel, the decision is mostly based on the programming and how the show has fared in other countries. "Sometimes there are properties like Pokémon and Beyblade that work well universally, then in addition to that we had the licensing rights for the latter and hence it was a no brainer. We knew that it was going to big. We get a lot of offers from third parties to represent Cartoon Networks Enterprises but we make sure that we work with only those who will work for us right across," says George. "We are trying to bring in Beyblade video games in India but right now, they don‘t have too many games in the formats that work here. India is entirely PC format whereas the games available are in the Game Boy format," he adds. The introduction of Beyblade tops have actually dipped the sales of other toys in the boys‘ category like GI Joe, Superman, Batman and Justice League apart from eating into the shares of Funskool‘s own toys informs George. Funskool had launched Pokémon cards and a select range of toys around it but the speed with which Beyblade has become popular beats everything else. What lies ahead are the different seasons of the show on Cartoon Network. Beyblade has a total of three seasons with about 51 episodes in each. The first season gets over in October, which is when the second season launches. The third season of Beyblade will launch next summer. And what‘s more, each season will see new tops in the market that will compliment the season that‘s on air. Coming to the issue of the rampantly breeding piracy market where toys are concerned, Cartoon Network Enterprises is not too bothered about it. George gives his reason - "What‘s amazing about Beyblade is that there is a sense of snobbishness among kids about the original Beyblade. In the case of printed paper, it is easy to copy but the Beyblade has a steel rim around it and the fake one looks distinctly different from the real one. So I‘m not so worried about piracy." The verdict is out. Beyblade is one of the most popular shows on Indian television and more importantly one that has captured the pulse of the kids at a greater speed than any other show ever has. Does it get bigger than this? Only time will tell... but for the time being, it‘s back to the Beystadiums!